If the thought of keeping track of your finances is either wonderfully appealing or completely associated with nightmares, Bills For iPad could be for you. 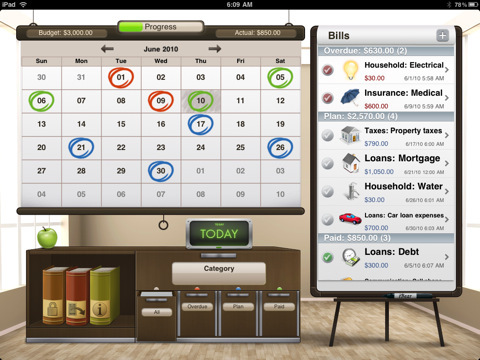 The iBearsoft creation brings order to financial scatter with an easy to manage calendar based dashboard for all matters of finance. 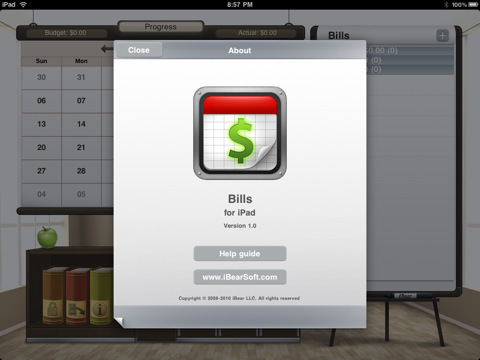 In other words, Bills for iPad is essentially a virtual room where keeping track of bills is of the utmost priority. 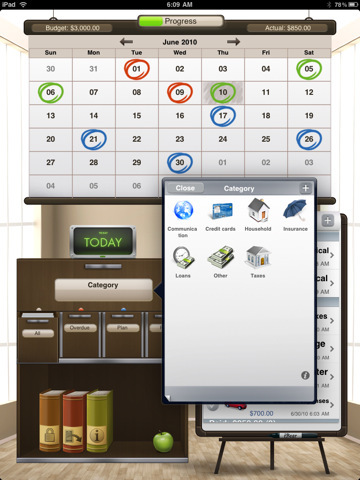 The screen is filled with a calendar for sorting through dates, a poster board (for overdue, planned, and paid bills), a virtual file cabinet where bills are categorized by status, and a group of virtual encyclopedic books with administrative functions. 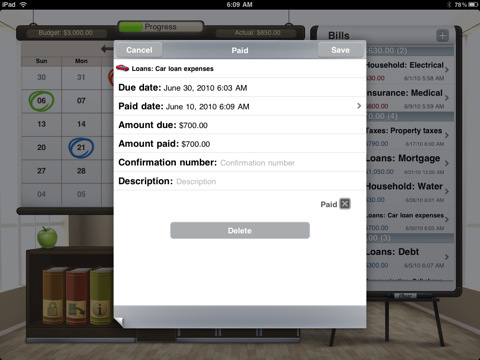 This dashboard layout is clever and cute, but where Bills for iPad really shines is in its functionality. The app lets you add bills, categorize them in preset or custom-made sections, and keep track of exactly what’s what when. Creating a new bill to keep track of is as simple as clicking the plus mark in the upper right hand corner of the bills bulletin board and filling out the details. The details for each bill include categorization, forms for letting you choose a due date, automatically renew the due date (e.g. every day, week, month or year), entering the amount and confirmation number, and describing the bill in one line or paragraph form. After you’ve created a bill it shows up on the bulletin board under plan (or overdue) until you mark it as paid via the red checkmark on the left side of the item. Paid bills then move automatically into the paid section, which is about as rewarding as apps get (especially when it comes to money). From there all the bills are filed away in the aforementioned filing cabinets near the bottom of the iPad screen. This prevents clutter in the main interface while making sure that old bills and confirmations numbers are accessible when necessary. Users who want to review all their bills can retrieve categorized bills and payments through the category drop down menu above the files. The books to the left of the cabinet let you set pins, export your files as .csv or .html files via iTunes or email for any set timeframe. You can also tab on the spine of the last book in order to sync your information to other iDevices via Bluetooth. Overall the functionality is robust enough to handle just about anything in the bills department, but I’d love to see the next generation of the app take a stab at actually connecting to bank accounts and making sure that the bills get paid. As it stands you’re stuck with keeping track with Bills for iPad and then doing the actual paying elsewhere. Beyond that understandable lack in functionality, Bills for iPad is intuitive, simple, and as robust as anything you could ever ask for. Bottom Line: Bills for iPad is a powerful tracking system that does almost everything except actually pay the bills you’ve set to track in the first place. It’s also incredibly simple to use, even if you’re not a finance or iPad geek.